History was made at the Belmont Stakes in Summer 2015 when American Pharoah won the Triple Crown title, the first racehorse to achieve the momentous feat since Affirmed in 1978. Pharoah was the crowd favorite, as spectators had anxiously anticipated the American Thoroughbred's victory, already a proven winner at the year's earlier Kentucky Derby and Preakness races. By all appearances, American Pharoah has led a successful career, unmarred by any controversy as he was the undisputed champion-only twelve horses total in American history have won the Triple Crown. Unfortunately however, his training team has not fared nearly as well. With accusations ranging from sour business transactions to poor gambling practices to active litigation with bankruptcy courts and other legal cases pending, his owner Ahmed Zayat has many rooting against him. The flamboyant Egyptian-American businessman has been leading a double-life that has threatened to overwhelm his small empire. Victor Espinoza, the famed racehorse's relentless jockey, left rural Mexico only to face harsh conditions on a farm where he had to overcome his fear of horses before learning that he had a gift for race riding. Finally, Bob Baffert, American Pharoah's trainer, has an interesting arc that includes tremendous wins, personal losses, and controversial medication violations. 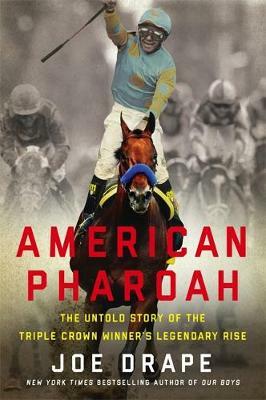 Beginning with American Pharoah's modest showing at his first maiden race in 2014, Joe Drape will recount the winning thoroughbred's explosive racing career by weaving in details of Zayat's questionable business practices, Espinoza's heartbreaking loss with California Chrome last year, and Baffert's temperamental, unreliable track record. By interviewing many of the parties involved, Drape will explore the claims of corruption, illegal gambling, and secretive business practices that have been prevalent throughout, all that have ultimately contributed to the makings of this award-winning racehorse. "There is much to admire in this comprehensive and often candid book."